Skin is the largest organ in the human body and it absorbs about 60% of what we put on it, whether those chemicals are good or bad for us. Chemicals like parabens, talc, phthalates, and sodium lauryl/laureth sulfate are commonly found in beauty products where they often function to stabilize or preserve the products for a long shelf life. The downside is that many of these chemicals are allergens, carcinogens, and can even disrupt hormones. One way to avoid these nasty chemicals are to read labels better and use the Cosmetic Database (see the links section of this blog) to find better beauty products. Another fun project is to make your own natural body products where you can control what goes into your products and onto your skin. I have been making my own handmade shea butter hand cream for a couple years now and it’s not a difficult process though it does take some time. It’s easy to make large quantities of the stuff so have a little party and invite some friends over to help out and everyone gets to take some natural hand cream home. Put 2 inches of water in a pot and place it on the stove and keep the flame medium. Bring it to simmer. Put the Shea butter in a stainless steel bowl or medium Pyrex. Keep it over the pot like double broiler. Let the Shea butter melt. After it gets melted, add 4 oz (1/2 cup) of almond or grapeseed oil. You can also add a mixture of these oils, if you want. Make sure that the mixture is a total of 4 oz in quantity. Add one 1 tsp cornstarch to the Shea butter. Open the vitamin E capsule and add its contents as well. Add 1 tsp of cosmetic grade fragrance oil or essential oil at this point (optional). Some of our favourites are vanilla and orange or flowery scents like gardenia and freesia. Put some heavily iced water in a really big bowl (but not too much water). Take off the bowl which you had earlier put on the pot and keep it in the larger bowl, on the top of iced water. Make sure that the water doesn’t find its way into the mixture. Take a hand mixer with a whisk attachment (not egg beaters) and blend the ingredients on medium setting. Continue to blend like the way you make whipped cream. When the mixture appears like whipped cream and stiff peaks get formed on the top, stop blending (it might take a while to get there if you have a large batch of shea butter). Now, take off the Pyrex or stainless steel bowl from ice water. Store your mixture in a plastic container, with a tight fitting lid. For best results keep hand cream in the fridge. Notes: This recipe is easy to double, triple, quadruple, etc. it really just depends on the size of bowls you want to use. When we are making this at home we usually start by melting a lot of shea butter in a pot in the double boiler and measuring out how much we need into a separate bowl. We also usually start with a quadruple batch of unscented shea butter hand cream just so that there’s no chance of getting some fragrance oil into the unscented bowl. A quadruple batch will easily fill 30- 40 2 oz/60 mL plastic containers depending on how “fluffy” you whipped your shea butter. If you’ve used this recipe to make your own hand cream….congratulations! You’ve made your own all-natural hand cream. The shea butter hand cream we make is oily but so nourishing and has no nasty chemicals in it. Everything in it is basically edible except for the fragrance oil/essential oil. 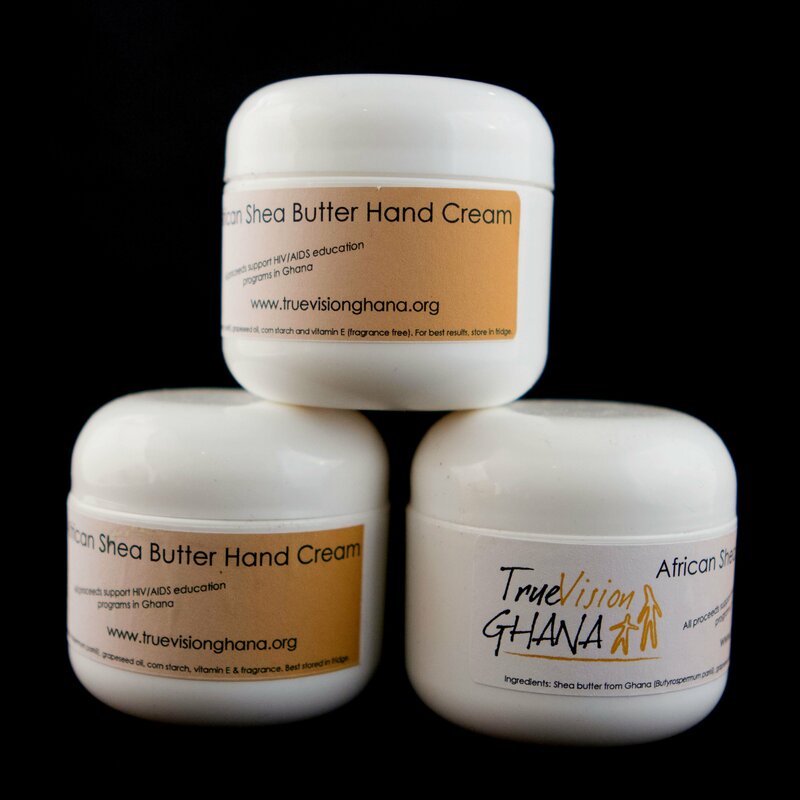 I make shea butter hand cream to benefit True Vision Ghana, a nonprofit organization working with AIDS orphans in Ghana. We sell a 60 ml/2 oz jar for $10 each in unscented, Tahitian vanilla, sweet orange, gardenia and freesia varieties. We’re also experimenting with new products and different scents as well. If you’d like to purchase some shea butter hand cream just leave us a note at this blog. If you’d like to volunteer at one of our shea butter hand cream making parties and learn how to do this for yourself we would be more than happy to have you. Contact us through this blog for more information.